Spacia glass is modern double glazing but with only a quarter of the thickness of standard double glazed glass. This brings a new degree of thermal performance to older buildings and opportunities for thin glazing in new buildings. Pilkington Spacia offers a real solution to the problem of balancing historical preservation with modern comfort and environmental requirements. 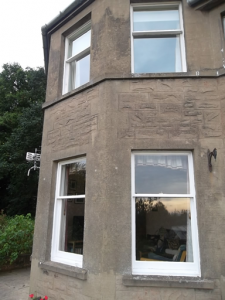 The glass is perfectly suited for use in original, refurbishment or new thin profile frames, allowing the property to maintain its original appearance. Spacia glazing consists of an outer pane of low-emissivity glass and an inner pane of clear float glass, separated by a micro spacer grid of small pillars, which are robotically positioned. 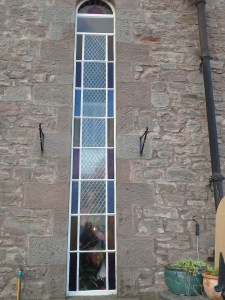 This grid ensures that the two glass panes are kept a fixed distance apart. The edges are welded to achieve a hermetic seal. Air is extracted to create a vacuum via the extraction point, rather than being air or gas filled. The result is an excellent thermal performance from a unit that is only slightly thicker than single glass. Pilkington Spacia provides a cost-effective method of improving the energy efficiency of older properties where glazing choice is restricted or where original frames are a desirable feature. Four times better thermal insulation than single glazing, helps to reduce heat loss from property. Suitable as a replacement for single glazing in original frames, to retain the appear ance of older traditional buildings. Suitable for other applications where use of thinner, low-weight glazing is desirable, such as sliding box sashes. 10 year warranty with an even longer life expectancy. Can be used in secondary glazing applications for enhanced thermal performance. Greater internal comfort, as cold spots close to the window are reduced. Internal condensation risk levels are significantly reduced when compared to single glazing. Compatible with most silicone sealants and a broad range of putties for a traditional finish. Can be leased to match traditional designs. Face applied bead can be used to mimic existing Georgian designs is one large pane is preferred to using several small panes. A range of non-rectangular shapes, for flexibility with orginal frames. A sandblasted version is available where privacy is required. Improves energy efficiency, reduces carbon emissions and your heating bills.